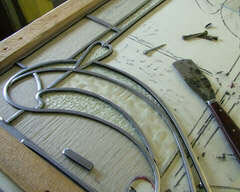 I carry out all repair and restoration work on stained glass and leaded lights.The lead came has a life of approximately 100 years depending on where the window is situated. In a busy door way, constantly opening and closing, it may be less. 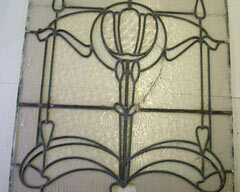 You can easily tell if your stained glass window needs restoration if they rattle when tapped or if they are bowed. 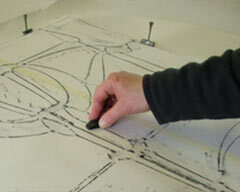 We can also carry out simple repairs in situ. 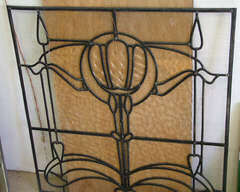 One single broken piece does not always mean the whole panel has to be removed. A survey is usually required but quite often I can give you an idea of costs from a measurement and photos so do contact me. 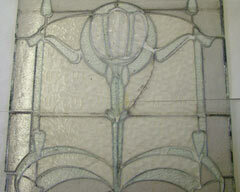 A typical leaded light restoration: follow this art nouveau leaded light through its journey from dilapidated window, falling apart, to a new lease of life! The first stage is the removal of the panel. We can do this for you or we can provide instruction and support to enable you to remove it safely yourself. Once in the studio we take a rubbing of the window to create a “cut line”. This is the drawing we will work from to recreate the window. 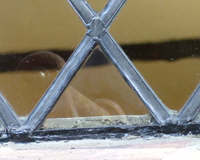 The “cut line” shows the entire lead pattern and other vital information like the size of the window, the widths of the leads and where copper ties should be situated. Once we are sure we have all the information we need, we take the panel apart, carefully teasing each piece of glass away from its lead. We recycle all the old lead! 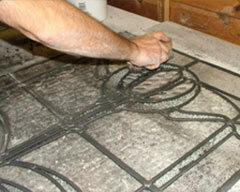 Then we cut replacements for any pieces of glass that are broken. 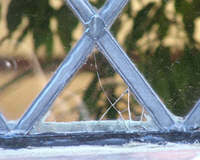 For this particular window it was difficult to match the broken glass as it is no longer manufactured. We always try to find the closest possible match and never throw any old glass away just in case it comes in useful as a repair! In this case we found the closest possible match and then fired it in the kiln to produce the same texture as the original. 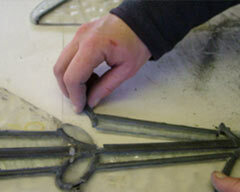 The next stage is to lead the panel back together using leads of the same width and profile as the original lead. All the joints are soldered. The panel is cemented to make it weather proof. The excess cement is cleaned off. 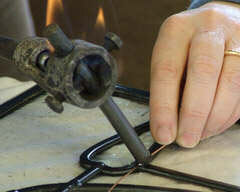 Soldering on copper ties is the final stage for us in the studio followed by a final polish! The result is a window with a whole new lease of life, sparkling and shining but almost totally original. We can install it for you, or we will provide support for you to install it yourself. 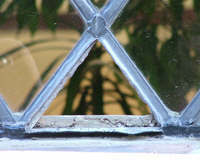 For added security, and better insulation, it is often possible to encapsulate refurbished windows in a double glazed unit.